Hazardous Level: The most dangerous type of spiders are the Black Widow and the brown recluse spider. These do end up in Hamilton and Toronto from time to time though shipping of food and such from America. Multiplication Level: A spider can carry 250 eggs in a sac. Up to nine sacs produced per year. Recognize a spider. Spiders are easily recognizable by four pairs of legs and a large sac like abdomen. The size of a spider ranges from 10 - 20mm. Colours can be brown, grey or black. Spiders can be a nuisance in your home! Anypest can do a thorough exterior spray of foundation, around windows, doors and soffit areas to put up a protective shield around your home, this will also protect you from other insects (ants, flies, bees, earwigs, centipedes) The second step is to spray all baseboards of home to ensure all insects are exterminated. Are Spiders hazardous to humans? Yes. The most dangerous type of spiders are the Black Widow and the Brown Recluse which do end up in Toronto and Hamilton during our warm months. Typically a black window would hide under bits of wood left over from under your deck, or in the deep recesses of your cupboards and closets. Bites from any spider should receive immediate medical attention. 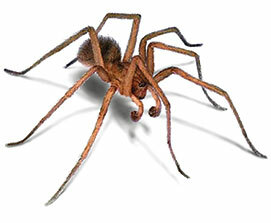 The female spider lays or carries approx. 250 eggs in a sac. Up to nine sacs produced per year. An infestation of spiders can number in the thousands. What can I do if I have a Spider infestation? It is recommended to seek the services of a trained Pest Control professional to eliminate pests for thorough results.